Mr. H recently asked the HIStalk Advisory Panel to weigh in on how the ICD-10 delay will impact their organizations. My organization had asked me to put together an impact statement, but I was waiting a few weeks to see if CMS issued a final date. Now that we know it will be October 1, 2015, we can start quantifying the costs. Some of them are fairly straightforward, but others are a bit more nebulous. Like many of the Advisory Panel respondents, we will have a fairly significant cost for retraining physicians. We had already started many of our employees through a training program. Although initially it was informational and high level, we were set to accelerate rapidly into the summer. At this point, we have placed all training on hold and will plan to start from scratch again next January. One of our training strategies included interactive Web sessions which are invoiced monthly based on our number of licensed providers. I was pleased to find out that our legal department had inserted a clause that addresses any delay of ICD-10, so we won’t be losing much on that contract. We’ll see if the vendor tries to renegotiate, however. We had planned to have additional last-minute training sessions provided by contractors in September. We won’t lose much on those, either. The vendor involved doesn’t charge for cancellations that occur with at least 60 days’ notice. Given the fact that we’re going to have a longer training window, I doubt we’ll need those resources for the next go-round. One of our major costs, however, will be the training that we’ve already put into our existing coding staff. Although the majority of our ambulatory physicians are expected to do their own coding, there are some subspecialties (particularly surgical) where coding staff are deeply involved. Additionally, we have our internal compliance and audit teams. We had already sent those teams through specialized training and they may need a refresher. Due to their specialized training and knowledge of our organization, we had provided retention bonuses for several of them to stay at least through November. Given the fact that many organizations will be retraining, I suspect their value will continue to increase and we’ll likely be extending those retention payments. We will also have increased upgrade and testing costs. Our upgrade plan was pretty straightforward since our ambulatory vendor’s ICD-10 version is also their Meaningful Use 2014 version — we were planning to kill two proverbial birds with one stone. We had already done the majority of the testing and the code is already in production, so we thought we were home free. Now we’re going to have to take at least one if not two updates prior to ICD-10, which means more testing. Worst-case scenario, there could be more updates, because it seems like every time CMS issues a new FAQ or refines an existing answer, our vendor has to create a hotfix. I feel bad for our vendor. As a high-visibility client, I have come to know many of the senior development team members personally. I know they have agonized over the hours they put into meeting certification and regulatory requirements and the fact that those projects have cut into clinical and usability issues. Even though they’re a vendor, I know they don’t have an endless pot of money or endless resources. Hard choices had to be made. There were a few times in the past few years where I sat on focus groups with other clients to discuss various development initiatives and rank potential work, so I know directly how much consideration went into those decisions. That opportunity cost will play forward to our providers as lost functionality. I know our vendor has plans to use this honeymoon period to shift back to usability enhancements and adding functionality. Although this is a good thing, I would bet that due to the increased regulatory and certification complexity, they will take more time to deliver new features. We’ll be playing a game of chicken to decide which updates to take based on existing vs. future features and the testing timeline as we approach October 2015. In my mind, though, one of the more significant issues isn’t really quantifiable. I’m not sure how much of an impact it will be. Many of our providers now assume we are on a slippery slope towards skipping ICD-10 altogether. I had forgotten everything I learned in middle school about voice votes vs. roll call votes, but the nuances of how the actual legislative timeline unfolded on this one have been an interesting read. I’m not sure if Congress used this as a deliberate jab to undermine the very clear statements by CMS on there being no delay or if they were just oblivious to the nuances of the ICD-10 portion of the bill. Who is to say that some crafty legislators won’t sneak something in later? 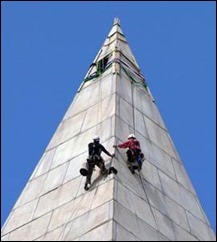 The only good news I’ve heard out of Washington recently is the reopening of the Washington Monument after being damaged by the 2011 earthquake. I’m a big fan of our National Parks and had visited shortly before it was closed. I hadn’t been aware that half of the $15 million restoration was funded by a private contribution and was pleased to learn it was completed on time and on budget. Maybe something inside the beltway can be done right, after all.